Elon Musk as a Big Pimpin Playah; Raises $1Bln USD for SpaceX! On January 20th, Hawthorne,CA based Space Exploration Technologies (SpaceX) confirmed that it has raised approximately $1Bln USD ($1.24Bln CDN) from two new powerhouse investors, Mountain View, CA based Google Inc. and Boston, MA based Fidelity Investments. It's been a busy week. SpaceX CEO Elon Musk, or at least a cartoon image backed up by his actual voice, guest starred in the January 25th, 2015 episode of The Simpsons as himself. Earlier in the week, as outlined in the January 26th, 2015 Quartz article, "Elon Musk settles with the US Air Force, smoothing the way for competition in spy-satellite missions," Musk announced a settlement with the US Air Force, "ending a lawsuit that accused the military of unfairly awarding an $11 billion launch contract to United Launch Alliance, a Boeing-Lockheed Martin joint venture ." Graphic c/o Fox. The deal will not only provide SpaceX with the capital needed to achieve its goals, but also marks a watershed moment in the history of the NewSpace industry. Capricorn Venture Partners (CVP) – A Belgium-based venture capital and equity fund manager whose portfolio includes a variety of European clean tech, medical, and IT firms. Draper Fisher Jurvetson (DFJ) - A Menlo Park, CA-based venture capital firm with $4Bln USD ($4.96Bln CDN) in assets under management. DFJ has funded many technology firms including Chinese web services company Baidu, Hotmail (acquired by Microsoft in 1997), and Skype (acquired by Microsoft in 2011). DFJ has also invested in Elon Musk's Tesla Motors and SolarCity companies, SugarCRM, Meebo, Twitter and Tumblr. Founders Fund (FF) - A San Francisco, CA-based venture capital firm with $2Bln USD ($2.48Bln CDN) in assets under management. The firm's portfolio includes Airbnb, Knewton, Lyft, Spotify, Stripe and ZocDoc. FF was also one of the earliest investors in Facebook and the first institutional investor in SpaceX. Valor Equity Partners (VEP) – A Chicago, IL-based venture capital firm with approx. $994Mln USD ($1.24Bln CDN ) in assets under management. VEP's portfolio includes Tesla Motors, Family Health Services (a provider of nursing and other home care services) and Sizzling Platter (a restaurant operating company). How will SpaceX put this new funding to use? What do Google and Fidelity stand to gain? The announcement comes on the heels of SpaceX founder Elon Musk's Jan 17th reveal of his plan to place a constellation of several hundred low-cost satellites 750 miles above Earth. Such a system has the potential to provide fiber-speed internet access to everyone on Earth. Musk has stated that such a system would serve two roles: tapping the potentially enormous market of low-cost high-speed internet access for the developing world and providing a telecommunications infrastructure for his planned human settlements on Mars. Google, which is developing programs of its own for low-cost internet access via balloons, drones and satellites, as most recently described in the November 18th, 2014 post, "Google Takes Control of Hangar One," likely seeks to harness SpaceX's expertise in spacecraft and launch vehicles. Fidelity Investments has not publicly offered any statement on its involvement, but with SpaceX on the verge of achieving low-cost space access and the subsequent opening of a huge new market to many players, the scent of profit must be strong indeed. Google and Fidelity Investments' investment in SpaceX is a sign that more conventional investors are now willing to throw their hat into the space ring. As capital increasingly flows into NewSpace ventures, innovation will blossom. Over time, new infrastructure and revenue will enable even greater achievements. Space will then not only be the realm of scientists, but also of workers, merchants, artists, entrepreneurs and settlers. The true space age is about to begin. BC based UrtheCast is opening new offices and hiring new people. The firm has announced plans to open a second office in Vancouver able to house up to 40 video specialists, GIS experts, web developers and space systems engineers. DVD video in space. An overview of the existing UrtheCast configuration on board the International Space Station (ISS). Graphic c/o Bloomberg Businessweek. The additional space is required to support staff expected to be hired to fulfill a $65Mln CDN, five year contract signed last November with an unnamed, "confidential customer" for the provision of "engineering services, value-added services, and Earth imagery data." The new facilities are expected to open in March 2015. The announcement was included as part of the January 24th, 2014 UrtheCast press release, "UrtheCast Opens New Office, Ramps Up Hiring." As outlined in the press release, "UrtheCast continues to ramp up its search for top talent in Vancouver and San Francisco, with a dozen career opportunities ranging from web development to space systems engineering." As outlined in the November 24th, 2014 UrtheCast press release, "UrtheCast Signs Contract For $65 Million To Provide Value-Added Services and Data," the original contract provided for the payment of 20% of the total in advance, plus included "a letter of credit" to cover for the balance of payments. Of course, the last few years haven't always been smooth sailing for the firm which first went public, as outlined in the June 10th, 2013 post "UrtheCast Proceeds with Takeover and Funding for ISS Camera's," in a reverse takeover (RTO) of publicly traded Longford Energy Inc. Early problems, as outlined in the July 20th, 2014 post, "UrtheCast Hi-Res Camera Still Not Working but Solution (and More Cameras) are on the Way," were only recently superseded, initially by new business partnerships, and later, by the November contract. 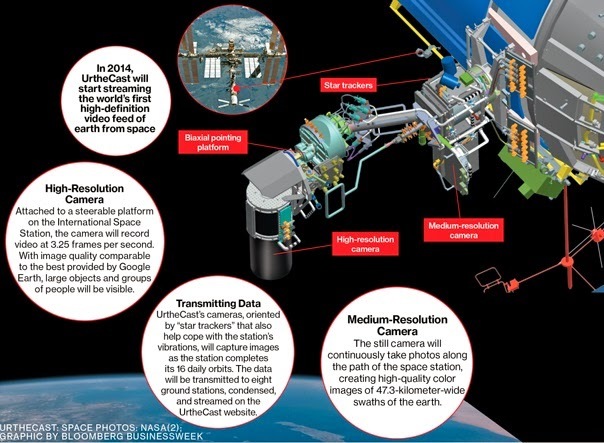 UrtheCast has said it intends to distribute operational software for the first publicly accessible high definition cameras installed on the International Space Station (ISS). The firm has offices in Vancouver, San Francisco, Washington DC, St. Louis and Moscow. ISDC 2015 literature. Graphic c/o CEC Global Events. For the second time in under a year, a major international space conference is setting up shop in Toronto. Hot on the heels of very successful 65th International Astronautical Congress (IAC 2014) comes the National Space Society's International Space Development Conference (ISDC 2015) which will be held in Toronto, ON from May 20th - 24th, 2015. The annual ISDC is considered "the keynote event" of the U.S. based National Space Society (NSS), and brings together over 1000 leading managers, engineers, scientists, educators, and business people from civilian, military, commercial, entrepreneurial, and grassroots advocacy space sectors to discuss a variety of topics related to space and space activism. Recent speakers have included Aerospace Corporation principal engineer William Ailor (2014), ATK Aerospace business development VP Jim Armor (2014), space tourist and entrepreneur Richard Garriott (2014), XCOR Aerospace CEO Jeff Greason (2014), Air Force Rapid Capabilities Office (AFRCO) director Dave E. Hamilton (2013), Center for the Advancement of Science in Space (CASIS) director Brian Harris (2013), Indian ex-president and scientist/ engineer A.P.J Abdul Kalam (2013), space solar power advocate and Artemis Innovation Management Solutions president John Mankins (2013 - 2014), SpaceX CEO and CTO Elon Musk (2014), meteorite "man" Geoffrey Notkin (2014), PricewaterhouseCoopers Canada director of business development and global markets Sandra Pupatello (2013), US representative and vice chairman of the science of the congressional space and technology committee Dana Rohrabacher (2013), Moon Express co-founder & CEO Robert Richards (2013 - 2014), Mars Society president Robert Zubrin (2013 - 2014) and several hundred others. The current line-up for 2015 includes retired astronaut and second man on the Moon Edwin "Buzz" Aldrin, Jr., the first female "space tourist" Anousheh Ansari, former Canadian Space Agency (CSA) president/ astronaut and current Liberal MP for Westmount--Ville-Marie Marc Garneau, the current general manager of the Air Line Pilots Association, International (ALPA) and former deputy administrator of NASA Lori Garver and even a few people who still work in the space industry, such as former NASA astronaut and current director of crew and mission operations for the Boeing commercial crew program Christopher J. Ferguson and Virgin Galactic CEO George T. Whitesides. According to CEC Global Events (CEC) director Aggie Kobrin, several dozen more speakers are expected to be announced over the next little while to fill out the program. CEC is the organizer of the event for the NSS and is working in conjunction with the Canadian Space Commerce Association (CSCA) which is functioning as the local organizing committee. 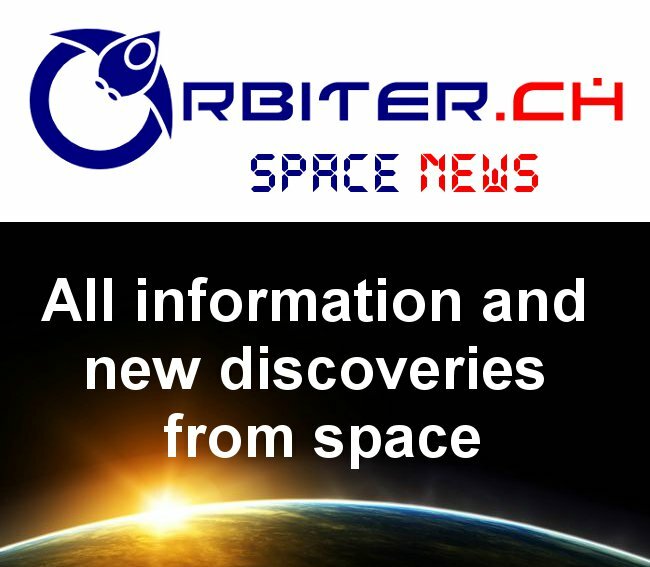 As per the January 12th, 2015 press release, "Indian Space Research Organization Mars Orbiter Programme Team Wins National Space Society’s Space Pioneer Award for Science and Engineering." the NSS will also be honouring the Indian Space Research Organization (ISRO) for the ISRO Mars Orbiter Program Team and the Mars Orbiter Mission. For more information on the event, check out the ISDC 2015 website at http://isdc2015.nss.org/. The Hyatt Regency Toronto will be hosting the 2015 International Space Development Conference from May 20th - 24th, 2015. For more information, please check out the Hyatt Regency website at https://aws.passkey.com/event/11486046/owner/1460357/home. The hotel is also one of the hubs of the Toronto International Film Festival (TIFF). Graphic c/o Hyatt. Is Jay Aspin Canada's First "Real" Space Politician? Canada's most space industry friendly politician might no longer be the Liberal member of parliament (MP) for Westmount - Ville-Marie. At least that's the impression Conservative MP Jay Aspin is attempting to convey as he winds up his first tour as chair of the newly created parliamentary "space caucus." Kirkland Lake Mayor Bill Enouy and Nipissing-Timiskaming MP Jay Aspin shoveling. 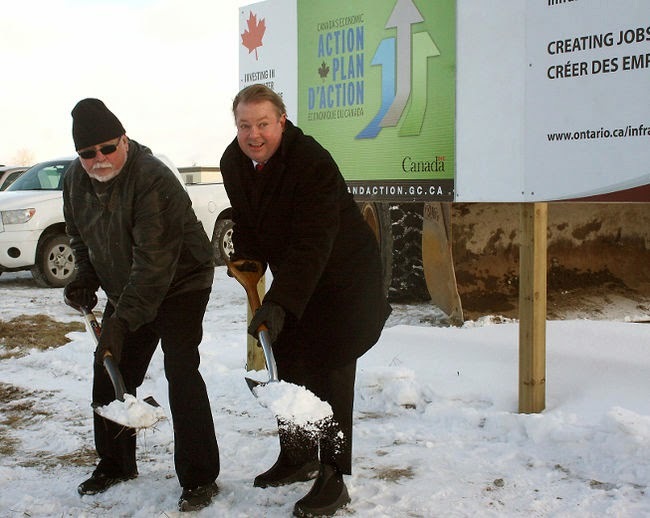 As outlined in the December 12th, NorthernNews.ca 2012 article, "Sod turned for new $35 million waste water plant," the two were breaking ground for a new $35 million waste water treatment facility which subsequently opened for business in October 2014. Photo c/o NorthernNews.ca. As outlined in the January 17th, 2015 BayToday.ca article, "Aspin leads space caucus tour," the ambitious Federal representative for the riding of Nipissing-Timiskaming, (who also acts as vice-chair of the parliamentary aerospace caucus) led a tour of caucus members to Cambridge, ON based Com Dev International and the Brampton, ON robotics and automation division of Richmond, BC based MacDonald Dettwiler (MDA) on Friday. “The purpose of the Space Caucus is to give parliamentarians a first-hand appreciation of Canada’s space industry,” said Aspin. As outlined in the November 30th, 2014 post, "Ambitious MP Announces Canadian "Space Caucus" Focused on the Economics and Business of Space," the space caucus is just one of a series of activities which Aspin hopes will cement his hold on the riding in time for the upcoming Federal election, later on this year. Aspin initially finished just 14 votes ahead of Liberal incumbent Anthony Rota in the 2011 election, which triggered an automatic judicial recount but eventually confirmed his tight 18 vote final victory. It's even possible that Aspin might not be just blowing in the wind when it comes to making promises to the space industry. As outlined in the June 30th, 2014 post, "Canadore College Testing New European Space Plane Design," Aspin helped organize the November 2013 North Bay Aerospace Forum, which was attended by many of the world's aerospace heavyweights. These included Boeing, Bombardier, Dassault, Lockheed Martin, and Pratt & Whitney. The meeting led directly to a contract to perform drop testing of a European designed suborbital space plane at the Jack Garland Airport in North Bay. More recently, as outlined in the January 13th, 2015 Nugget.ca article, "Funds available for collaborative aerospace projects," Aspin participated in a session at Canadore College, along with North Bay Mayor Al McDonald and Ontario Centres of Excellence (OCE) director of business development Richard Worsfold. The talk focused on the recently-created Consortium for Aerospace Research and Innovation in Canada (CARIC), which has about $4Mln CDN in available funding and will soon begin receiving proposals for collaborative research and technology development projects. Which is certainly more than Liberal MP Marc Garneau has been able to accomplish for the Canadian space industry over the last little while. But is Aspin simply the newest "flavor of the month" for the Canadian space industry? Or is he in the midst of becoming a player? That's likely something which will only become apparent after the next Federal election. Stay tuned. Luc Brûlé. Photo c/o CSA. 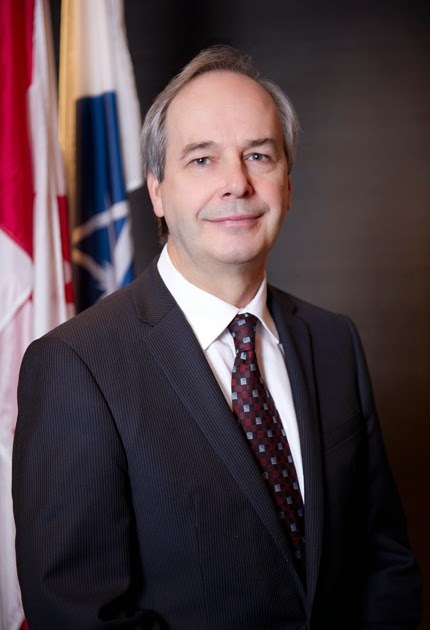 Interim Canadian Space Agency (CSA) president Luc Brûlé has kept a low profile thus far in his tenure, much like he has for most of his career, which has made it difficult to get any sense of either his interests or the CSA's future direction. Of course, this might be for the best, given that Brûlé is essentially a "place holder" until Industry Minister James Moore announces the next, official CSA president, an action not currently expected to occur anytime soon. But a presentation given by Brûlé at the 2011 International Geoscience and Remote Sensing Symposium (IGARSS 2011), which was organized by the Institute of Electrical and Electronics Engineers (IEEE) and held in Vancouver, BC, does shed some light on both his area of expertise and potential CSA future plans related to Earth observation (EO). Supporting the development of new concepts for Canadian and international EO instruments and missions. Fostering participation of Canadian scientists and companies in Canadian and international EO missions. Canadian participation in the European Space Agency's (ESA) EO programs. All of which sound not a lot different from what CSA is currently involved with. As outlined most recently in the August 9th, 2014 post, "Industry Minister Allocates $6.7Mln to Develop Space Apps," the CSA continues to encourage the development of domestic expertise in this area. 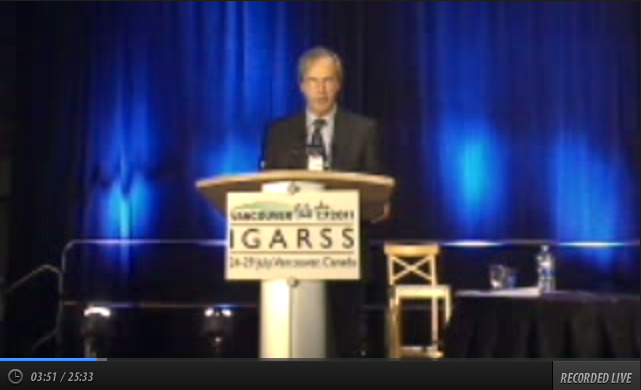 A fuzzy screen shot from IGARSS 2011, showing Luc Brûlé, the then CSA Director General of Space Utilization presenting on the topic of "The Evolution of Space Observation in Canada: A Perspective." A video recording of the presentation is available online at http://www.ustream.tv/recorded/16241019. Screen capture c/o ustream TV. The RADARSAT Constellation Mission (RCM), a 2018 mission supported by the Government of Canada. RCM will consist of a fleet of three C band utilizing synthetic-aperture radar (SAR) satellites to be used for maritime surveillance, military/civilian communications, and environmental monitoring. A collaboration between Canada's RCM and the ESA's Sentinel-1 Earth imaging satellite, which uses a C band SAR satellite constellation similar to RCM. Sentinel-1's first satellite was launched in April 2014 and a the second is scheduled for 2016. The Polar Communications and Weather (PCW) mission, a 2016 Canadian government mission to place a constellation of satellites in high orbit above the Canadian arctic for communications, space weather monitoring and maintaining arctic sovereignty. Oddly enough, this also seems a reasonably accurate assessment of current CSA activities. The Earth Observation Application Development Program (EOADP), intended to stimulate Canadian industry. The Government Related Initiatives Program (GRIP), intended to enhance Canadian government services. Scientific and Operational Applications Research (SOAR), a joint program between MacDonald Dettwiler Geospatial Services Inc. (MDA GSI) and the Canadian Government to provide access to RADARSAT-2 data to scientists and academia for research purposes. Of course, the presentation didn't discuss the CSA astronaut program, likely because this area isn't part of Brûlé's publicly acknowledged expertise. But it's worth noting that CSA currently has no Canadian astronaut scheduled to visit the International Space Station (ISS) and likely won't have one before 2018. It's also worth noting that the presentation power-points are available online and in video form. Check them out for the useful insights they provide into the mind of our current CSA head. Here are a few of the unfolding Canadian space stories currently being tracked by the Commercial Space blog. The space sector, particularly its legislative component, has always been known for studies and reports and Canada is no exception in this area. As outlined in the October 27th, 2014 post, "Free OECD Report on Space Economy Provides Guidance for Upcoming Paid CSA Report," a Canadian Space Agency (CSA) contract valued at $285,000 CDN to undertake a "comprehensive socio-economic impact assessment" of the Canadian space sector, should be complete and ready for presentation by January 30th, 2015. However, there is so far no advance word on whether the upcoming report (compiled by the North American subsidiary of Paris, France based Euroconsult) will supplement or supersede existing documents, such as the annual State of the Canadian Space Sector Report (which is typically released during the December/ January period) and no suggestion that the report might ever be released to the public. Of course, the private sector is often perceived of as being more forthcoming with information. As outlined in the January 8th, 2015 press release, "COM DEV Announces Details of Fourth Quarter and Year End Fiscal 2014 Conference Call," Cambridge based COM DEV International will be releasing its Q4 and year end financial results, plus hosting an investor conference call to discuss them, on Thursday, January 15th, 2015. With 1200 employees, the firm is a global provider of space hardware and services with annual revenues of $216Mln CDN, and facilities in Canada, the United Kingdom and the United States. As outlined in the December 15th, 2014 post, "COM DEV Buys a Scottish Microwave Equipment Manufacturer," the company has just concluded the first of a promised series of international acquisitions intended to grow the company and gain access to foreign markets. And, as discussed in the January 10th, 2015 Bloomberg post, "Canada Funds’ Bid for Telesat Said to Hit Financing Snag," the ongoing attempt by Loral Space & Communications Inc. (LORL) to sell its Telesat shares to the Ontario Teachers’ Pension Plan and the Public Sector Pension Investment Board, has been delayed again. This time, the sale stalled amid a "regulatory clampdown on the leveraged-loan market." As outlined in the December 3rd, 2014 Wall Street Journal article, "Private-Equity Firms Adapt to Regulatory Clampdown," the use of borrowed assets to fund purchases, which boost immediate overall returns to an acquirer, could also potentially burden the acquired company with too much debt to ever return to profitability after the purchase. 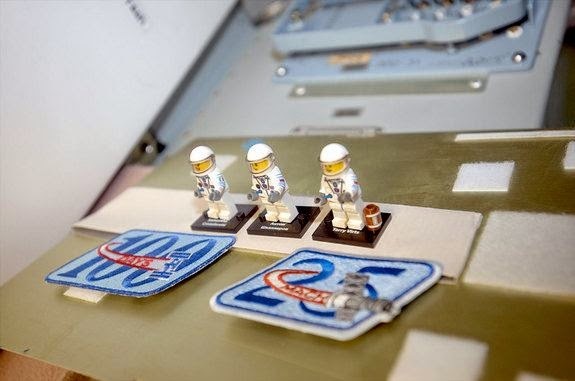 LEGO minifigure versions of Expedition 42 crew members Terry Virts, Anton Shklaperov, and Samantha Cristoforetti are seen on the International Space Station. Lego Chris says hi. Photo c/o NASA. But in an industry generally assumed to be at least as much about encouraging the efforts of "boys with toys," it's refreshing to find an actual toy company bearing gifts for real space geeks. As outlined in the Yahoo News UK article, "Astronauts Get Their Own LEGO Minifigures on Space Station," LEGO mini-figures customized to look like NASA astronaut Terry Virts, Roscosmos cosmonaut Anton Shklaperov and European Space Agency (ESA) astronaut Samantha Cristoforetti were among the gifts the crew exchanged on New Year's Day. According to the article, the LEGO was a gift from Cristoforetti, who received them from a ESA training instructor, who commissioned them from the UK-based company Minifigs.me. Is the US Patent System Broken? Two recent stories, one of which relates directly to the space industry, illustrate the legal difficulties involved with commercializing new innovations under the US patent law system while a third article, posted on the Canadian based Ridout and Maybee law firm website, argues that US patent law makes Canada "a more attractive jurisdiction for initial patent filings." In the US, landing a spacecraft on a surface ship might just be subject to patent protection. Artwork c/o Dmitry Vishnevsky. Taken together, they illustrate the complexity and confusion surrounding current legal thought in the area. The first story, the January 5th, 2015 Wired article, "Our System Is So Broken, Almost No Patented Discoveries Ever Get Used," discusses the US patent system and how the current patent process is "a market so constricted by high transaction costs and legal risks that it excludes the vast majority of small and mid-sized businesses and prevents literally 95 percent of all patented discoveries from ever being put to use to create new products and services, new jobs, and new economic growth." If we’re honest with ourselves, we must admit that the patent system today has lost much of its original democratic character. Sure, anyone with a good inventive idea (and at least $20,000 for legal and other fees) can get a patent. But what can you do with that patent? More than likely, you won’t be able to put it to good use unless you have the multi-million-dollar resources required to launch a startup, secure a licensing deal with a big corporation or, if necessary, litigate to stop an infringer. Perhaps the most effective example of this state of affairs is the recent lawsuit between Space Exploration Technologies (SpaceX), which will attempt to soft land a Falcon-9R first stage on an ocean going platform during its next launch attempt, and Blue Origin LLC, which was issued a patent on the processes related to just that sort of activity a few years back and seeks claims against SpaceX for infringing on its patent. Part of the supporting documentation for the Blue Origin filed U.S. Patent Application No. 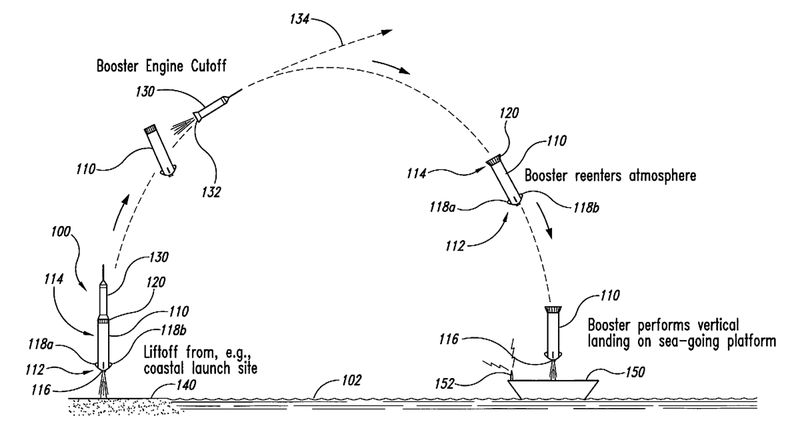 12/815,306, entitled “Sea Landing of Space Launch Vehicles and Associated Systems and Methods” with a priority date of June 15, 2009 which became US Patent No. 8,678,321 in March of 2014. In essence, any successful claim against SpaceX will be mitigated by the size of the investment SpaceX made in the program before the claim can be resolved in court. This is something a smaller and less well financed company could not reproduce and goes a long way towards explaining why larger companies have an advantage in patent litigation. The 1998 paper "Re-entry and Terminal Guidance for Vertical-Landing TSTO (Two-Stage to Orbit)" which is readily available online and contains many of the core concepts relating to US Patent No. 8,678,321 from March of 2014, but predates it by 16 years. Graphic c/o Aerospace Research Central. However, the core of the SpaceX defence against the Blue Origin lawsuit isn't the amount of money its spent on the program; it's the counter claim that Blue Origin’s patent “treads on technology that existed way before Blue Origin filed for the patent application,” and should therefore be struck down. As outlined in the September 24th, 2014 Space News article, "SpaceX Bringing the Right Stuff to Patent Slog with Blue Origin, Expert Says," the SpaceX defence references a variety of publications to bolster this point, including the paper “Re-entry and Terminal Guidance for Vertical-Landing TSTO (Two-Stage to Orbit),” which was published in 1998 by the American Institute of Aeronautics and Astronautics (AIAA). Why does this point to a problem with the US system? That's simple. The US system makes the attempt to focus on the rights of the first to invent rather than the first to file a claim. In the case of Blue Origin, while it was certainly the first to file for the patent, any indication that someone else had actually made the invention would certainly invalidate any patent protection claimed by Blue Origin. And this is what SpaceX is attempting to do. It's just a shame that the company needs so much cash for lawyers and inventory to keep the wheels on the bus in motion until the claim is settled. But if you really want to get confused over the way the US system works, a Canadian law firm is offering an alternative. The undated article on the Ridout and Maybee law firm website, "Upcoming Changes to US Patent Law Make Canada a More Attractive Jurisdiction for Initial Patent Filings," suggests that recent changes in US patent law have changed the system from one which protects the "first to invent" to one which protects the "first to file," at least in the case of a foreign filing claim, from places like Canada. All of which makes it even more confusing for small firms and inventors to compete with larger companies. Maybe Blue Origin should have filed its patent in Canada? A private UK-based group that aims to land a probe on the lunar surface by 2024 has successfully raised over £672,447 GBP ($1.2Mln CDN) via crowd funding. The ambitious Lunar Mission One (LMO) project seeks to land a drill-equipped probe on the Moon capable of drilling to a target depth of 100 m beneath its surface. The drill will penetrate down to unexposed rock and extract core samples for transport back to Earth. In addition to collecting rock samples, the probe will deploy thermal sensors that will measure heatflow through the moon's core as well as a seismometer that will measure moon quakes and meteor impacts. The samples and sensor data will provide greater insight into the Moon's origins as well as provide data that can be used to plan future missions, including long-term projects such as a crewed lunar base/spaceport. Besides achieving these scientific objectives, LMO will also pursue a more connected goal. Inside the borehole, the probe will place a time capsule containing a record of life on Earth. Backers who pledged more than £60 GBP (approx $108 CDN) will receive their own "digital memory box" to be buried in the time capsule. Backers can fill their "box" with personal messages, photos, audio or video. They can can even send a strand of their hair if they want their DNA on the moon. The group will continue selling the digital memory boxes even though the crowd funding campaign has ended. The LMO kickstarter crowd funding website on December 18th, 2014. Graphic c/o Kickstarter. As of Wednesday, Dec. 17th, 2014 (the campaign's end date), LMO had raised enough money to fund the project. The project is managed by the Lunar Missions Trust, a UK-based not-for-profit group whose board includes engineers, investment advisers and space scientists. The probe will be built by RAL Space, a space R&D group that operates out of the Harwell Oxford Science and Innovation Campus, located in Oxfordshire, UK. The project has assembled an impressive list of partner organizations from across UK academia, industry and government including the British Interplanetary Society, international law firm Fieldfisher Waterhouse LLP, the Imperial College London, the Open University, the Pagefield independent communications consultancy, the Science & Technology Facilities Council and the University of Oxford. LMO, by harnessing the skills of a broad pool of talent, gained a support base from multiple organizations and crafted a clear and focused message by offering a personal connection (via the memory boxes) to provide the ideal template for space-related crowd funding. With such a firm support base, the odds for success increase...breeding further success. Others would do well to watch and learn.